In mid-December, Microsoft’s new application Office Sway was released to the public. Currently we’re talking about a preview version, so more features are to be expected, yet it’s already clear how useful Sway is. Some sites and blog posts have compared Sway to PowerPoint and are predicting that it will challenge or even replace PowerPoint as the number one presentation software. I wouldn’t go that far; at least I’m not going to give away all my PowerPoints that I use in my trainings. Sway, however, does have its strengths compared to, for example, PowerPoint. In order to use Sway, you don’t have to install any software or pay for license fees. We are talking about an online application that you can use for free to create Sway presentations and share them easily by sending a link to the presentation. You can also embed Sways in your website. All you need in order to use Sway is a Microsoft account, so that you can log in. Making Sways is easy and the outcomes are elegant. Unlike many other Office programs, the Sway user interface doesn’t try to simulate tangible life (paper, pages, slides), which means working with Sway is genuinely digital. There are no pages, just different sections. You can add headings that add new sections with sub-headings, and text components or media straight, for instance, from Youtube or OneDrive. Menus and ribbons are gone and all the functions are embedded in the view in logical places. Especially for the growing number of tablet and mobile users, I can imagine Sway to be a pleasant way to create stylish presentations easy and fast. Students will surely make use of Sway for their studies as well. Depending on which device the presentations are primarily viewed with, you can select the structure of your Sway to be either scrolling vertical (desktop) or a horizontal one to pan through (handy for tablets and mobile devices). Later there will be more structures available. There are twelve different themes with set fonts, color schemas and backgrounds and the amount will increase in the future. If you can’t make a choice between the themes, you can always click on the Remix! button and let Sway randomly select your theme. You can also decide, whether you want the images to be in groups, stacks or separate. I myself find the stack of images a fun way to present them. You can create presentations, guides, photo books, web pages and a lot more with Sway and the outcome is something between a PowerPoint presentation and visual web pages. For the time being, you can only use Sway by logging in with browser, but in Australia and New Zealand, there already* is an iPhone app which allows offline editing as well. Android app is currently in the making. If you want to convert your old PowerPoint files (or PDF or Word files) into Sways, you can import them very easily. Especially a converted PowerPoint looks nice even without any extra editing after the import. Sways are public by default. You can’t set user rights and once you’ve sent the presentation link to someone, anyone with the same link can view your Sway. You should think twice if you’re considering to share confidential presentations with Sway. Not for printers! You shouldn’t even try to print your Sways, as it will only give you gray hair. Both my favorite application OneNote and Sway encourage you to work in a paperless office and at the same time you don’t have to worry about saving your work constantly. The data and presentations are always at hand. It’s easy, right? Below is an example of a travel story created with Sway. Try it out yourself! *) After writing this post Sway for iPhone has become available in the following countries: Antigua and Barbuda, Australia, Bahamas, Barbados, Belize, Botswana, Canada, Cayman Islands, Dominica, Fiji, Gambia, Ghana, Grenada, Guyana, Hong Kong, India, Ireland, Jamaica, Kenya, Liberia, Malawi, Malta, Mauritius, Federated States of Micronesia, Namibia, New Zealand, Nigeria, Pakistan, Palau, Papua New Guinea, Philippines, Saint Kitts and Nevis, Saint Lucia, Saint Vincent and The Grenadines, Seychelles, Sierra Leone, Singapore, Solomon Islands, South Africa, Swaziland, United Republic of Tanzania, Trinidad and Tobago, Uganda, United Kingdom, United States, and the British Virgin Islands. Microsoft published Delve as part of the Office 365 package in September. By spring 2015, also those organizations that are not using the Office First Release option will have it in use. Now is the perfect time to get to know what Delve is all about. Delve uses Office Graph to find out who and what you’re working with and based on that information, shows you the most relevant content. Office Graph uses advanced machine learning techniques to analyze the actions of the people in your work network. For example, editing a document and collaborating on a document count as actions. Delve shows a different view for every user according to their personal interests, actions and user rights. The goal of Delve is not just to help you search for information: it aims to bring the relevant information to you and make the search function unnecessary. The more you and your colleagues work and collaborate together by viewing, editing and sharing files, the more beneficial Delve is for all of you. 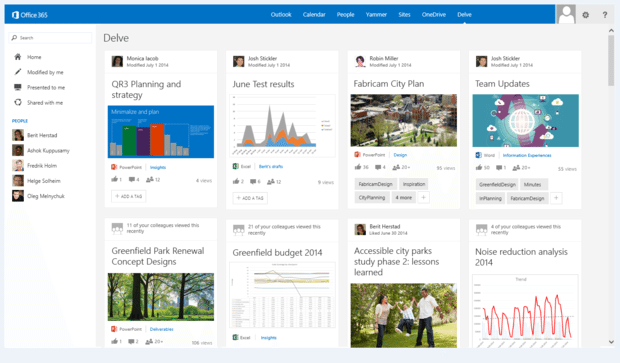 Office Delve connects people with relevant files and data. A search-oriented user might think that Delve offers nothing new, as all the search features work so well nowadays. That’s partly true, but imagine a situation, when you can’t remember the location a file is saved, let alone the name or title of the file. If you, for example, were in a meeting with your colleague and he showed you a PowerPoint presentation, which you now want to review. You don’t know, where that file is stored and you can’t even be certain if the presentation was originally compiled by your colleague. Office Graph recognizes that you two were in the same meeting and that your colleague showed you a presentation. Thus, this presentation can be found in Delve under Presented to Me. Currently Delve incorporates content from OneDrive, SharePoint and Yammer, but later other Microsoft products, such as OneNote, Lync and Outlook e-mail attachments, will be included as well. Office Graph indexes content also from e-mails, even though e-mails as such are not shown in Delve yet. The idea of Delve is to connect data to the people you’re working with. For instance, let’s say your colleague Lisa has showed you a file that has to do with learning. If you do a search with the keyword “learning”, you’ll get a huge amount of search results. In Delve, you can look for files that Lisa has worked with. Just click on Lisa’s name and you’ll see all the files and people in Lisa’s work network. You don’t have to pay too much attention to the metadata or remember the location of the file; you can just simply link files to people. It’s much easier to remember a person’s name than the name of the file or what kind of metadata is linked to the file. When everyone in a team uses Delve, the need to send files as e-mail attachments or have status meetings decreases, and people don’t constantly have to ask for help for locating the relevant files. I can already see in my Delve all our blog posts that our marketing saves in OneDrive before publishing them. I can’t wait for the time when it’s not necessary for me to send customer service response time reports to my supervisor by e-mail, as he can see the new reports in his own Delve. These examples decrease the need to send e-mails and the need for manual internal communications. From now on, I will always keep track of all the information that’s relevant to me.